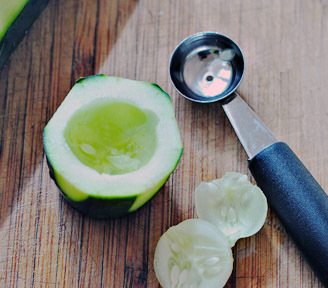 Using a melon baller, scoop out the center of the cucumber pieces, being careful as not to go through the bottom of the “cups”. Make sure your cucumber pieces are big enough to leave a base for the cups after you scoop most of the meat out. For the filling: In a small bowl, combine the caramelized onions, chives and low-fat sour cream. Start with just a little until you have the right onion to sour cream ratio you prefer. Season to taste with garlic and salt. Spoon the filling into the cucumber cups, top with crumbled turkey bacon pieces. These are best chilled a bit before serving. This entry was posted in Healthy Ideas, Metabolic Medical Center Recipes, Modified Profast (Fast and Flexible) Recipes, Party & Entertaining, Vegetables and tagged carmelized onions, cucumber, turkey bacon by foodies4mmc. Bookmark the permalink.